JANSSONIUS -Nova Totius Belgii sive Germaniae Inferioris. . .
JANSSONIUS, J. - Nova Totius Belgii sive Germaniae Inferioris. . .
Nova Totius Belgii sive Germaniae Inferioris. . . - JANSSONIUS, J. Title : Nova Totius Belgii sive Germaniae Inferioris. . .. Size : 17.5 x 21.5 inches. / 44.5 x 54.5 cm. 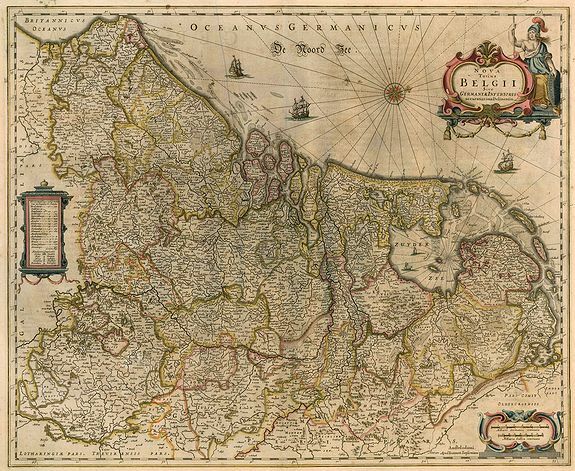 Description :Map of The Netherlands. Condition : Some browning. Slight shine-through of text. Tears reinforced with old paper at verso of the map.